Leonard W. Hardy was a General Authority of The Church of Jesus Christ of Latter-day Saints. He served as first counselor in the Presiding Bishopric from October 6, 1856, to his death on July 31, 1884. He served under two Presiding Bishops. Hardy was born on December 31, 1805, in Bradford, Massachusetts. He was baptized a member of the Church by Orson Hyde, who was serving as a missionary. Hardy himself served as a missionary to England beginning in December 1844. He labored with Wilford Woodruff, Dan Jones, and Hiram Clark. On his first night in England, he slept unknowingly in the bed of a person who had died of smallpox. With the bed linen not changed, he caught the disease. His life was preserved through a priesthood administration from the other elders. 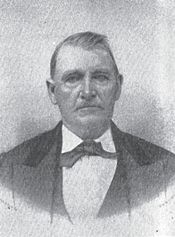 After Hardy returned home, he immigrated to Utah Territory with other pioneers in 1850. On the journey, he contracted cholera but survived. In Utah, Hardy served as bishop of two different wards. He practiced plural marriage; he married Elizabeth Harriman Nichols in 1826 and later took four additional wives and fathered eighteen children. This page was last edited on 14 November 2017, at 15:26.